It takes an awful lot for me to find a name that I have not heard of in terms of internet casinos. I have been reviewing these virtual betting spots for quite a while (too long, if you ask some people), so there is a bit of added intrigue when I get to review these casinos. When taking a look at Fone Casino on my Android smartphone, I was acutely aware of the issues that many mobile casinos have. These issues include touch screen response issues, bad deposit and withdrawal options, and games that are gutted versions of games that aren’t a lot of fun to play. Thankfully, Fone Casino is a better casino than many of the mobile betting destinations. While it may not be a perfect casino, it is certainly able to overcome the obstacles that plague many other spots. BetOnSoft, a casino software provider that specializes in both PC and smartphone versions of casino platforms, powers Fone Casino. The mobile site is similar to what I have seen from other BetOnSoft casinos, but this is a good thing as these casinos offer an Android casino experience that is second to none. 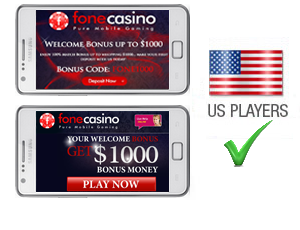 Signing up for an account with Fone Casino on my Android phone was a simple process, as all I had to do was click on the big register button and Swype in my personal information. The whole setup process was quick and easy, much better than some of the RTG or sportsbook Android casinos I have played at in the past. When it came to me putting a deposit, I had a single option to put money in. This is because I am an American, and my options are limited through government laws. With this being said, I was able to get a deposit in through Visa card, which was instantly accepted and credited. This was conducted completely through my Android device, and was as simple as I have seen on a smartphone. Players registering through other countries can deposit through GiroPay, UseMyWallet, Ukash, and Bank Wire. There should be no problem using these choices, and account balances should be quickly reflected in your account. 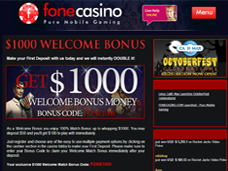 When it comes to bonuses, Fone Casino has a very nice offer for first time players. Using the sign up bonus, I was able to obtain a 100% match bonus on my deposit, up to $200. The playthrough on this bonus is not available for viewing on my Android, and I could not get any firm answers from the support group. For this reason, I did not use my bonus even though it was in my pocket to deploy. I would advise against using these types of bonuses unless you can get clear terms on what the rollover is. 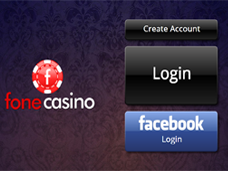 Fone Casino’s BetOnSoft library is identical to other casinos that offer this platform. The good thing here is that not many other casinos utilize this platform, and therefore the games feel fresh and are a lot of fun to play. I enjoyed the 25+ video slots that Fone Casino offers, as they are identical versions of their PC counterparts, which can be played at other spots (Fone Casino is a mobile only casino, afterall). The experience on my Android phone was superb, with graphics shining bright, the sound blaring loud, and the touch response working flawlessly. I had absolutely no issues playing any of the slots, and think that other betting software developers could certainly learn a thing or two from BetOnSoft. As with other casinos that offer this platform though, there is a tragic flaw: there are no table games. This is not the fault of Fone Casino, as they cannot control the games on the platform, but it is pretty disappointing that I cannot partake in Blackjack, Baccarat, or Roulette on my Android while on the bus or in a meeting. Video poker is available, and while it certainly is playable, the games are not nearly as fun as casino table games. When it came time for me to withdraw funds from my account, I ended up being given the following options: Check by Courier, Check by Mail, Bank Wire, and Credit Card Payment. These options are listed by speed in terms of fastest to slowest. I ended up opting for the FedEx check, and had to go onto my PC in order to scan and upload identity documents to Fone Casino. This is the only time I had to actually get off of my Android in order to do business with the casino, and feel that this is pretty reasonable. In terms of customer service, Fone Casino has a pretty solid staff that tried to help me out. Even though they were unable to help me with the terms of the bonus made available to me, I was happy with the fact that they worked to keep me abreast of information regarding my withdrawal. The staff was timely in their responses, and I can definitely say that I am pretty happy with what I saw here. Overall, I feel that Fone Casino is one of the nicer Android betting spots. The layout is very nice for those of us with big fingers, the games are fun, and the staff is as helpful as they can be. Negatives here are the lack of table games and the lack of terms and conditions for bonuses on the Android device. Both of these should certainly be here, and would truly bump this casino’s score up a notch.